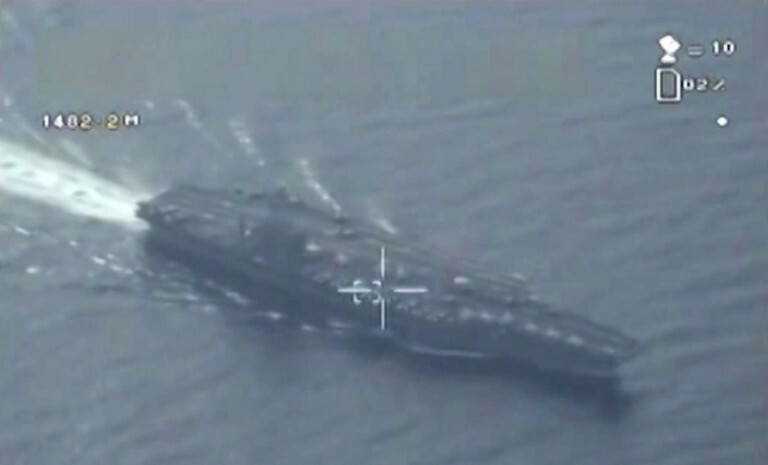 A screen shot from the video purportedly from an Iranian drone that flew close to a U.S. aircraft carrier. Via: Washington Post. Immediately following the detonation of Gilda at Bikini Atoll on July 1, 1946, a ghostly fleet of aircraft flew into the rising mushroom cloud. They looked like manned military airplanes, but they were actually drones. Here is the little-known story of the crucial role that drones played in Operation Crossroads. A report by the Intercept suggests that American and British intelligence agencies hacked into the video feeds of Israeli military drones. The program, known as Operation Anarchist, was revealed in a slideshow from the the U.K.’s signals intelligence bureau, which had been provided by former NSA contractor Edward Snowden to the Intercept. At Wired, Tim Moynihan weighs the benefits and downsides of current and future traffic management systems for drones. At Fast Company, Neal Ungerleider profiles Workhouse, an Ohio-based startup that plans to take on Amazon with a drone delivery system of its own. At the New York Times, Nick Bilton reflects on what it means to be spied upon by a drone. At Bellingcat, Adam Rawnsley takes a look at the role that Iranian drones play in the war in Syria. At Drone Laws Blog, Jeffrey Antonelli offers a beginner’s guide to legally flying a drone in the United States. At Motherboard, Jason Koebler revisits a 2011 incident in which local police in North Dakota used a Predator to help arrest a rancher. At DefenseNews, Tom Kington reports that all five of NATO’s Global Hawks are expected to arrive in Sicily by the end of the year, along with 600 personnel. At Slate, Jesse Kirkpatrick considers the possible psychological risks faced by drone operators. At the Houston Press, Chris Lane argues that it is better to consult with law enforcement before shooting down a drone that is flying over your property. The Congressional Research Service released a report that examines the different policy and regulatory challenges associated with integrating drones into the National Airspace System. The exhibition “To See Without Being Seen,” now on show at the Kemper Art Museum at Washington University in St. Louis, brings together a diverse range of contemporary artworks that address drone warfare. Examining the state of drone technology today, Quartz explains why drone delivery might not be as close to becoming a reality as you’d think. Sebastian Anthony, a reporter for Ars Technica, tried racing drones and found it much harder than he expected.